Here’s something that surprised me. A lot of people look at the photo above and see cats playing. 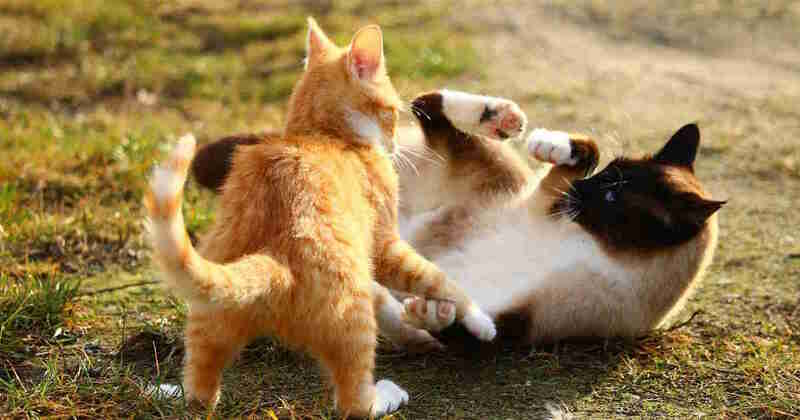 These cats aren’t playing, they’re fighting, and even if they don’t hurt each other, they aren’t having fun. Cats do develop friendships and often live happily in stable household groups. However, the sad reality is that cats are a territorial species who rarely tolerate the company of outsider cats. What catches most cat owners unawares is how bad a cat fight can be. Pus forms and collects in a swelling called an abscess. Read what to do about this later. Did you know cats have their own AIDS virus? Feline Immunodeficiency Virus is an important infection of cats in Australia (in fact, we have the second highest reported prevalence in the developed world). Here in Adelaide, we demonstrated an infection rate of 10% in our own patients. Just like in people, FIV causes opportunistic diseases due to immune suppression. Cats with FIV are more frequently unwell and generally live shorter lives. Pet cats only get FIV through the bite of another cat. Not every bite causes infection, but if cats keep getting bitten, it’s almost inevitable that they will get FIV. There is a vaccine and that’s why we always ask you if your cat goes outside when choosing which vaccines to give. Bartonella henselae is a bacterium found on some cats that causes a nasty infection in people. The classic signs are a reaction at the site of injury followed by a swelling and abscessation of the lymph nodes, usually in the armpit. I have never seen anyone get it so it must be reasonably uncommon in Australia. Visit this page to read about all the things you can catch from cats. I know from bitter experience how much it hurts. The most important thing to know about cat fight wounds is that here are two ways to treat them. A quick and easy trip to the vet. When you first notice your cat has been injured, most of the time just pain relief and antibiotics will fix them. A late and complicated trip to the vet. Once an abscess forms, it needs lancing and flushing, and sometimes a drain inserted. This must be done under deep sedation or anaesthesia. If you just leave an abscess, healing is very slow. Eventually, the skin over its surface can die and create a gigantic hole that requires reconstructive surgery. Of course, not every cat fight wound is detectable so even good cat owners will get caught out at times by an abscess. If you’re thinking about this path, read our guide to keeping indoor cats happy. Next PostNext How Long Do Dog Breeds Live?